CHARLESTON, W.Va. — Now that voters have approved the state road bond referendum, the next step looks to be a special legislative session. Gov. 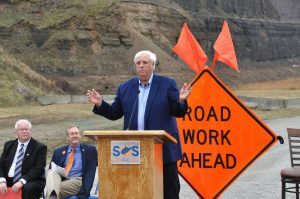 Jim Justice campaigned across the state for the road bond measure, which handily passed on Saturday. Not long after unofficial election results came in Saturday showing about 73 percent of voters across the state supported the Roads to Prosperity Amendment of 2017, allowing the state to issue up to $1.6 billion in road bonds, Gov. Jim Justice said he will likely be calling a special session. “We want to fine tune that, but we probably are,” he said. “But one thing that we absolutely need to address is the red tape and the bureaucracy that takes so ever long to be able to hire people and get people in position. There will be a couple of other things, and you’ll find out about that in the days to come. Regarding the special session, state Department of Transportation Secretary Tom Smith said he thinks it will include bills designed to streamline hiring within the department, but the governor has stayed tight-lipped on the nuts and bolts of the call. In separate interviews, both Senate President Mitch Carmichael, R-Jackson, and Speaker of the House of Delegates Tim Armstead, R-Kanawha, said they’ve had fleeting talks with the governor on the matter. Carmichael said they talked about legislation that would speed up the hiring process at the Department of Transportation, and Armstead said there might be something of a legislative effort to make sure the jobs go to West Virginians over anyone else. Delegate Andrew Robinson, D-Kanawha, shared similar thoughts. House Communications Director Jared Hunt said if a special session were to happen, he’d expect it to take place on the Monday of this month’s interim committee meetings — Sunday through Wednesday — since legislators will already be in town. The election turned out to be a blowout, with majorities in 54 of 55 counties — Ritchie County being the holdout — voting for the referendum. The next closest counties were Berkeley, where the vote passed with 51 percent supporting, and Hampshire, with 52 percent supporting. Perhaps it’s no coincidence two delegates from Berkeley County, Mike Folk, R-Berkeley, and S. Marshall Wilson, R-Berkeley, formed some of the staunchest and most vocal opposition to the bond’s campaign. In an interview Sunday, Wilson said those who supported the bond did so out of a misunderstanding of governance’s pitfalls. “The idea that giving government more money will fix any of our problems is predicated on the idea that government is the fix to our problems,” he said. While he and Folk have rallied against the road bond campaigners’ claim that no new taxes will stem from the referendum, he said now is the time for the Legislature to hold the governor to his word. Beyond issues with the bond, he said the low turnout, while somewhat expected, came as a disappointment to him. He said it’s time for citizens to start paying more attention to the decisions their elected officials make and to start acting on that information. A little more than 120,000 West Virginians voted on the referendum, a sharp drop off from the roughly 713,000 who selected a presidential candidate in the 2016 election. There are more than 1.2 million registered voters in West Virginia, according to data from the secretary of state. On the matter of oversight, Armstead said the Legislature passed a bill during this session establishing a committee designed to oversee the Department of Transportation, which has been the focus, historically, of a number of kickback and corruption scandals.